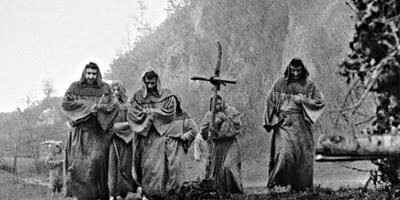 A combination of the direction of Roberto Rossellini and the screenwriting of Federico Fellini result in perhaps cinema's most serene religious movie.The life of the eponymous St. Francis is relayed in an episodic fashion, eschewing any sentimentality. Using non-actors, including real monks, the mundanities of monastic life are shown and, while undeniably partisan, the Christian ethos behind the film is not over-emphasised. Francis is not given star-billing, and in many of the chapters, he is not the focus of the story, but the guiding hand behind the somewhat hapless brothers. Whether the viewer is religious or not, all will be moved by the simplicity and elegance of Rossellini's almost neo-realist account of the saint. An interesting companion piece to Pasolini's Gospel According to St. Matthew.